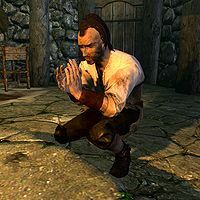 Tuthul is a Breton miner located in the Miner's House right by Soljund's Sinkhole, in the eastern part of the Reach. He wakes up at 7am and always starts the day with a one-hour breakfast. If the mine's still closed, he hangs around his house all day, eating one-hour meals at noon and 5pm, and goes to bed at midnight. If the mine has been cleared of draugr, he will head in there at 8am and work there for twelve hours, interrupted only by his usual meals back in the house. He wears some miner's clothes and some boots. He wields a pickaxe, and carries a key to his house as well as some lower-class items and a bit of gold. Before the mines are reopened, he'll talk about the draugr in the mine, saying, "We tunneled into an old crypt. We're warning strangers to keep out." or "I'm not going into the mine with draugr lurking down there." He'll also be dissatisfied with the lack of action taken by the guards, complaining, "Guards are useless. They just stand around waiting for a full regiment to come and help." When the mine is reopened, he'll still be rife with worry about the draugr, saying, "Any day now more draugr are going to come out of that crypt. ", "This mine will be our grave yet. I just know it. ", or "It's crazy to still be working here. What if there's more draugr down there?" Tuthul: "Those draugr are going to be back. I can feel it." Perth: "Don't be such a coward. We haven't seen any draugr since the mine was cleared. Be grateful." Tuthul: "I don't think it's safe mining a cave on top of that crypt." Perth: "There's a war on. We need every scrap of ore we can get, so we're going to keep digging. Understand?" Tuthul: "Fine, but don't say I didn't warn you." Perth: "Feels good to be mining again." Tuthul: "How can you say that? This mine was filled with draugr not too long ago." Tuthul: "I feel like any moment, a draugr is going to come and chop my head off." Perth: "Steel your nerves. The draugr are gone. Focus on your mining." Soljund's Sinkhole: Defeat the draugr in Soljund's Sinkhole. Perth: "The guards say no draugr have come out of the mine." Tuthul: "That's comforting. Glad they're keeping watch instead of getting rid of the draugr." Tuthul: "Those draugr are going to come up and kill us all." Perth: "They haven't moved out of the caves. I think we're safe." Tuthul: ""We're safe" he says. You'll eat those words when a draugr is tearing into your face." This page was last modified on 2 September 2018, at 22:15.